Is stress playing a bigger role in your life than you would like it to? For most of us, the answer to that question is a resounding YES! Stress is a fairly universal element of the modern human experience, and while some stress is appropriate, even productive, we now know that too much stress can be quite harmful, and can compromise our health physically, mentally, and emotionally. 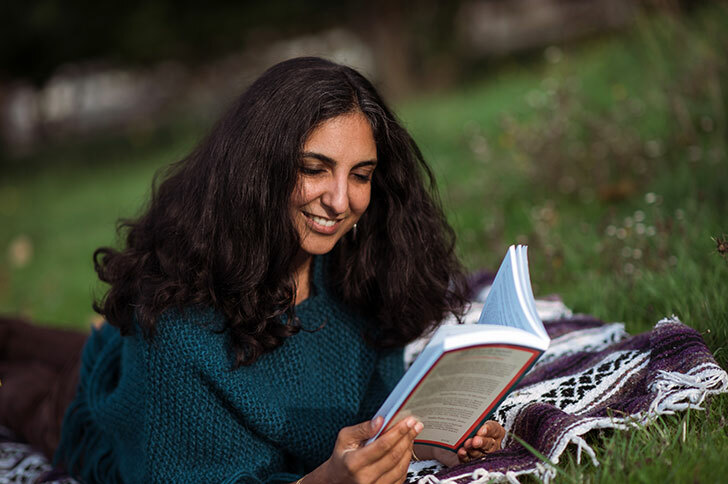 Ayurveda offers a beautiful perspective on stress management, but in order to better understand it, we will first explore the potential consequences of excess stress and establish a contextual understanding of the human stress response. When we are suffering excess stress, many systems in the body can be negatively affected: the digestive system and metabolic function (including imbalances in body weight), the cardiovascular system, the musculoskeletal system, the nervous system, the reproductive system, and the immune system.1 Excess stress can also impact our mental and emotional states, our relationships, as well as the health of our bones2 (and related tissues such as the teeth, hair, and nails). Stress tends to wear us down on a systemic level, so even though it is a contributing factor in a variety of ailments, its influence is easily overlooked. The bottom line is that, if you know that you’re stressed (even occasionally), there is a good chance that making some supportive adjustments could benefit you immensely. Cortisol reallocates the body’s resources; it makes more energy available to the brain and large muscle groups in order to accelerate speed and response times, but it simultaneously decreases urine production, inhibits inflammation, slows the digestive capacity, and stifles the immune response.5 These physiological changes are meant to support us in navigating (and hopefully surviving) the crisis at hand. Truth be told, the system serves us beautifully, as long as the crisis is followed by a period of rest, recovery, and recuperation, which has generally been the case throughout evolutionary history. But the circumstances of our lives have changed rapidly in a very short period of time (speaking in evolutionary terms). Our stressors have transformed and multiplied; they are everywhere, every day: a hectic morning, power struggles with willful children, traffic on the way to work, encounters with road rage, an irate boss, time-sensitive deadlines, long hours, bills piling up, challenging interpersonal dynamics, and countless others. It’s important to note that stress hormones cannot be turned off; long after a stressful event is over, the stress hormones released still linger in our systems.6 Chronic stress therefore tends to keep our tissues bathed in stress hormones almost continuously, which makes us hyper-vigilant, and ever more likely to trigger the fight-or-flight response again—even when faced with rather minor stressors.7 This can quickly become a viciously self-reinforcing cycle. At the same time, many of us are both more “networked” (think social media) and lonelier than we’ve ever been before. So all of this is happening as our core sense of community is changing, which has the potential to further sensitize the sympathetic nervous system. Chronic stress puts our bodies in a very difficult situation. On the one hand, our physiology is at the mercy of an endless barrage of stressors, with very little chance to recover, reset, and regain balance in between. This puts our systems on high alert and actually makes us more susceptible to stress. On the other hand, our support systems are often very weak. To make matters worse, most of us view stress itself as a problem, which can intensify its harmful effects on our physiology (more on that later). For now, let’s try to understand the broader implications of our modern relationship with stress, according to Ayurveda. Ayurveda shines in its capacity to distill a host of complex maladies into an elegantly simple collection of qualitative patterns, which help to illuminate a clear path toward healing for each individual. The Ayurvedic approach to managing stress is a beautiful example of this. One of Ayurveda’s foundational principles is that like increases like and that opposites balance. Ayurveda relies on twenty gunas (qualities)—organized into ten pairs of opposites—to describe various phenomena throughout the natural world. Identifying the qualities involved in a particular imbalance or disease helps to direct an appropriate treatment of opposites. When we distill the stress response down into its most essential characteristics, and begin to understand the qualities it activates in the body, we gain an intuitive grasp of how to use opposing forces to invite a return to balance. It is important to understand that none of these qualities is inherently good or bad. Each of them supports the maintenance of equilibrium in its own way. Similarly, too much or too little of any one of them can be problematic. The fight-or-flight response directs huge quantities of energy to the brain and the large muscle groups while shutting down non-essential activities (like digestion and the immune response)—rapidly consuming the body’s resources while inhibiting their ability to be replenished. Therefore, the stress response falls firmly into the reducing, lightening, catabolic category. It is intensely activating, energizing, strengthening, motivating, mobilizing, and accelerating. As a result, it activates the light, sharp, hot, dry, rough, mobile, subtle, and clear qualities in the body. In the short term, this can be very adaptive and beneficial, but if this depleting pattern goes on unchecked for any length of time, it will inevitably wear us down. So how do we stop the cycle? Obviously, if there are ways we can reduce the number of stressors we encounter each day, doing so is an essential starting place. But, there will always be stressors that we can’t control, and encouraging our nervous systems to respond to these situations in a healthier way is the key to reclaiming our health. If like increases like, opposites balance, and the stress response is unequivocally reducing, lightening, and catabolic in nature, then the antidote to excess stress is to offer our systems an abundance of the entire group of building, nourishing qualities—through our diets, our lifestyle, our practices, our relationships—basically, anywhere that we can get them. This means welcoming influences that are heavy, grounding, slow, unctuous, nourishing, soft, and stabilizing, while doing our best to minimize the influence of their opposites. 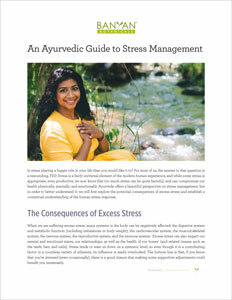 At its core, the Ayurvedic approach to balancing excess stress is really that simple. The rest of this article focuses on how exactly to invite these qualities into our lives in a supportive way. But it also explores how to release accumulated stress and tension from the mind and tissues in order to help promote a more easeful relationship with life. In the following paragraphs, you will find five simple steps to mitigating the effects of excess stress in your life. One of the most important first steps in balancing stress is to slow down. However, when we’re accustomed to living a fast-paced, busy life, slowing down can feel utterly impossible. It is not. For many of us, though, this can be very challenging—and often frightening. For those of us who can muster the courage to begin to invite a slower, more balanced way of being into our daily routine—one gentle step at a time—the rewards are often felt quite immediately.9 Then, with time, the positive changes reinforce our intentions and can encourage us to slow down a bit more, and then a bit more, and later even more. But how to begin? That is truly the crux of the entire endeavor. One of the best ways to slow the pace of our lives is through devoted and purposeful self-care: taking time every single day to be still, quiet, and immersed in self-nourishment. It is so important, in fact, that it is the next step in returning to balance. Purposeful and committed self-care can be a beautiful part of the healing process, and a meaningful opportunity to practice self-love. Each day, regardless of what else might be going on in our lives, a devoted practice of self-care reaffirms a deep commitment to Self, to wellness, and to vibrant health. Choosing to prioritize things like adequate rest and other nourishing practices can help us stay centered as we navigate the turbulence of the world around us. In truth, there are countless ways to nurture and care for ourselves. Those that impart a sense of grounding, relaxation, warmth, unctuousness, and stability will be best for balancing excess stress, but it is important that you follow your intuition; you know yourself best. Below, we have outlined a number of different possibilities. The list is by no means all-inclusive, but it is meant to provide a number of choices to spark the interest of diverse individuals. Trust what most appeals to you. And remember, it is usually best to choose just one or two new practices to start with. You can always add more as and when you feel inspired to do so. A bath relaxes the nervous system, releases tension, and helps to quiet the mind. If you like, you can add ⅓ cup Ginger powder and ⅓ cup baking soda to the water for increased relaxation and healing.10 This combination encourages circulation, sweating, and detoxification, but it is also quite soothing, making it very supportive when stress is elevated. If your pitta is high, be mindful that the ginger and baking soda can increase internal heat and you may not want to stay in the bath as long. An Epsom salt bath can also be very relaxing and cleansing. Use hot water for kapha and vata, warm water for pitta. Swishing and gargling with warm, untoasted sesame oil or coconut oil helps to remove tension from the jaw, improves the sense of taste, and removes natural toxins from the mouth, teeth, and gums. Begin by sipping a tablespoon or two of Daily Swish, our specially-formulated oil-pulling blend, or use plain Organic Sesame Oil. Swish the oil from side to side, front to back, and through the teeth for up to twenty minutes. Spit out the oil and rinse with warm water. For more detailed instructions, see our resource on How to Do Oil Pulling. This ancient practice of self-massage with oil calms the nervous system, lubricates and rejuvenates the tissues, and promotes healthy circulation throughout the body. It is no coincidence that the Sanskrit word for oil, sneha, also means love. 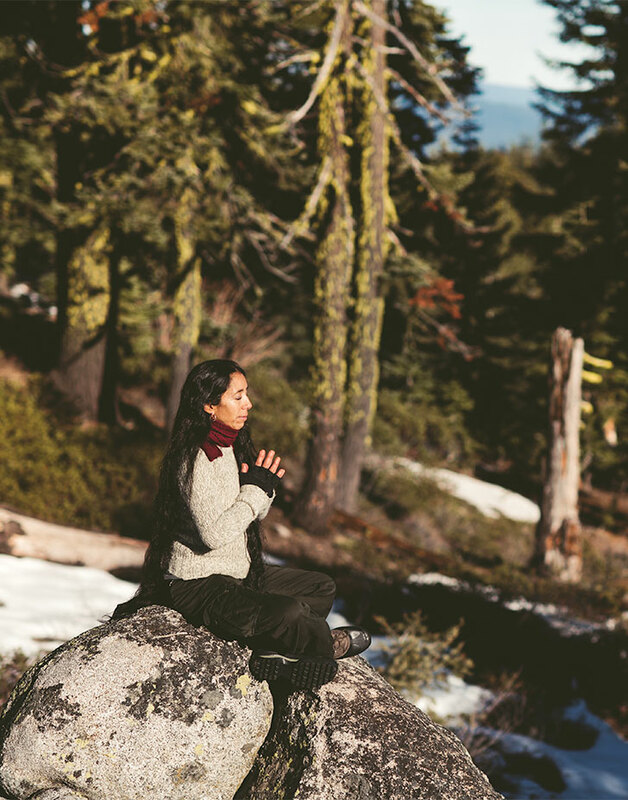 Abhyanga is a profound practice of rejuvenation and loving self-care that benefits both the physical body and the more subtle realms of consciousness. In addition, the oil itself forms a protective sheath around the body that can help to buffer the nervous system against stress. Each morning, before a shower or bath, massage about ¼–½ cup warm organic oil into the skin. For further instructions on this rejuvenating technique, and for support choosing the best oil for your constitution and current state of balance, please see our resource on Ayurvedic Self-Massage. Nasya is the practice of applying medicated oil to the nasal passages. It soothes these delicate tissues, promotes unobstructed breathing, relieves accumulated stress, and supports mental clarity. Nasya should not be performed by pregnant or menstruating women. Each morning, apply three to five drops of Nasya Oil into each nostril. If you are new to the practice of nasya, please see our helpful instructional video. Before bed, apply some warm Sleep Easy Oil to your feet. Or if you prefer, use plain Sesame Oil, Brahmi Oil, or Bhringaraj Oil. This practice grounds the energy, soothes the nervous system, reduces stress, quiets the mind, and promotes sound sleep. Remember that sleep is one of the body’s most essential avenues of rejuvenation. Be sure to wear some old socks to bed to protect your sheets. Often, simply exposing our nervous systems to the natural world—to its sights, sounds, smells, textures, and rhythms—is enough to activate the “rest and digest” capacity of the parasympathetic nervous system, which governs periods of relaxation. Consider a gentle walk, sitting by a stream, taking in a gorgeous view, or simply surrendering your body to the surface of earth for a while (weather permitting). If the idea of taking time to connect with nature speaks to you, this practice is probably worth pursuing. A good, inspirational read can go a long way toward signaling the entire system to relax and rejuvenate a bit. As a culture, we tend to expect productivity, and many of us experience tremendous guilt around being “unproductive.” But when we’re exhausted, stressed out, and tending toward hypervigilance, there is nothing more soothing than simply taking a good long break—maybe even an energizing afternoon nap. Our systems often also find great refuge in a good laugh, a loving connection, a reassuring hug, a sympathetic ear, and other encouraging relational signs that we are, indeed, supported.11 If you have terrific friends, close family members, or beloved pets who can nurture you in this way, consider carving out some time for a meaningful connection with your tribe. Sleep is an important antidote to excess stress. It has considerable restorative functions and plays a critical role in the repair and rejuvenation of tissues (both in the brain and throughout the body), but it also allows for the more efficient removal of metabolic wastes and natural toxins.12 If sleep is an area that you struggle with—whether you get too much sleep or too little—you may find our Guide to Balanced Sleep especially supportive. Otherwise, try to go to bed and get up at about the same times each day, and aim to sleep for at least eight hours each night. When we’re recovering from excess stress, our bodies often need significantly more rest. In other words, at least for a while, it might be completely appropriate to indulge in more than eight hours of sleep each night. Ayurveda recommends a daily routine for everyone, but it is particularly essential when we are trying to balance excess stress. Our physiology is very much adapted to—and supported by—some sense of regularity. Actually, it is amazing how impactful a few adjustments to our routines can be. Think about the natural world and how prevalent routines are; most plants and animals are profoundly attuned to the cycles of day and night, the seasons, and other patterns that direct the broader community of life. By contrast, the human experience seems increasingly disconnected from these natural rhythms. Adopting even a modest sense of routine gives our nervous systems a number of comforting and reassuring reference points throughout each day. These touchstones send a resounding message to the deep tissues of the body that all is well, that we can be at ease. Over time, a context of predictability and safety allows the nervous system to relax, and a profound rejuvenation process can begin. There are some very simple first steps to establishing a daily routine—things like waking, eating meals, going to bed at about the same times each day, and if possible, maintaining a consistent work or activity schedule. These steps alone can have a profound effect on the nervous system. Including self-care or mindfulness practices in your daily routine will provide an even deeper level of support. If you find yourself drawn to the idea of an Ayurvedic daily routine, please consider visiting our Daily Routine Department, which explores this concept in depth, and offers personalized recommendations for different constitutions and imbalances. When engaged appropriately, exercise can be a panacea for improved health. While exercise itself may not be terribly building or nourishing, it supports the body’s natural mechanisms of rejuvenation—sound sleep, the ability to relax, and a balance between the sympathetic and parasympathetic nervous systems. Proper exercise helps to release accumulated tension, move stagnant mental and emotional energy, and improve circulation. It also kindles agni (the metabolic fire, which is essential to optimal health), improves digestion, bolsters the body’s detoxification mechanisms, and encourages proper elimination—all of which help to counter the effects of excess stress. Ayurveda offers the unique perspective that the type, duration, and intensity of exercise that is most balancing for each of us depends largely on our constitution, and current state of balance. If you do not know yours, our Ayurvedic Profile™ quiz is designed to help you identify both. After you know which of your dosha(s) need the most attention, our Daily Routine Department can guide you in establishing an appropriate exercise regimen. It is worth mentioning that for most people with chronic stress, a vata-pacifying exercise routine that is gently paced and grounding is often most appropriate at first. If you are not currently exercising regularly, keep in mind that a supportive exercise program does not have to be complex or time-intensive. A daily twenty-minute walk can do wonders for the entire system—body, mind, and spirit.  Chronic stress tends to ramp up the sympathetic nervous system so that our bodies react to even benign situations as if they were profoundly threatening.13 Ayurveda recommends a number of subtle therapies like pranayama, yoga, and meditation as an effective means of breaking this cycle, resetting the nervous system, and cultivating a healthier physiological response to stress. A number of Ayurvedic herbs also foster health in the mind and the nervous system and can be incredibly supportive. While we cannot live a life completely free of potentially stressful situations, we can certainly change our capacity to cope with them. This step is about calming the nervous system while celebrating and activating the human capacity to repattern the mind and reorganize the physiology. The following therapeutic strategies do both—each in their own unique way. They help us to digest and release accumulated tension and stagnant mental, emotional, and physical ama (toxins), but simultaneously encourage fluidity and ease throughout our bodies—both physically and energetically. Follow your inspiration in terms of where to start. Prana, the vital breath, is the subtle essence of the life force that animates each of us. It infuses every cell and tissue throughout our bodies and is carried on and stimulated by the breath. Imbibing prana helps to restore fluidity and vitality to the subtle energy channels of the body while digesting and eliminating stagnation and ama (toxins).14 One of the best ways to bathe our tissues in fresh prana is to practice pranayama (yogic breathing exercises). The practice of Nadi Shodhana is especially effective at clearing accumulated tension, relieving stress, and supporting an improved mental disposition in the face of everyday stressors. Yoga moves prana in the body, helps to dissipate tension, clears stagnation, and encourages fluidity, both in the tissues as well as in the mental and emotional spheres. Ayurveda offers a nuanced approach to yoga that specifically helps to balance whichever doshas need the most attention in your system. You can take our Ayurvedic Profile™ quiz to determine your current state of balance at any time, and our Yoga Department explains how to practice vata-pacifying, pitta-pacifying, and kapha-pacifying yoga. That said, wherever there is a history of excess stress, vata- and pitta-pacifying yoga routines are often the most appropriate. Imagine if we could consistently witness the stressors in our lives with detachment and clarity, focusing on purposefully responding to them rather than blindly reacting to them. Meditation helps us to develop this capacity through the cultivation of passive awareness, and can inform a far healthier response to stressful situations. Over time, a daily meditation practice can truly repattern the brain, helping to rewire our response to challenging circumstances. If you do not have an established practice, Empty Bowl Meditation is a wonderful place to start. Studies have shown that how we feel about the stress in our lives affects its impact on our physiology.15 If we view stress as a harmful influence, it generally is. If however, we view stress as an adaptive response to a difficult situation, its negative impacts are dramatically reduced.16 The stress response is an age-old mechanism for ensuring that we’re up to the task at hand. If we can simply acknowledge the intelligence behind it, and learn to relate to the hormonal cascade with a sense of gratitude and awe, we can actually minimize the harmful impacts of stress before they begin.17 That’s not to say that we shouldn’t also be working to reduce our exposure to stress in more general terms, but there is something to be said for befriending the utter intelligence and wonder of our instinct for self-preservation. Ayurveda also reveres a number of herbs for their ability to foster clarity and health in the mind-body organism. These herbs specifically bolster the mind and the nervous system, and can help to encourage a sense of ease in the face of our daily challenges. Ashwagandha has long been celebrated for its ability to support the body in coping with stress while calming the mind. As a highly regarded adaptogen, ashwagandha encourages quality energy throughout the day and sound sleep at night. Ashwagandha tablets and liquid extract are also available. Brahmi/Gotu Kola is incredibly sattvic in nature and is renowned for its ability to balance the nervous system and the mind. It is a cooling, relaxing tonic for pitta, and it helps to calm vata in the mind. Brahmi/Gotu Kola liquid extract is also available. Mental Clarity tablets offer deep support to both the brain and the nervous system. This formula helps to calm the nerves while encouraging concentration, intelligence, mental health, and emotional stability. Stress Ease tablets offer strength, resiliency, and tone to the neuromuscular system, helping the body to better cope with stress. This blend of potent herbs introduces rejuvenative qualities that buffer the body against weakness, fatigue, and overwhelm, helping us to face physical, mental, and emotional challenges alike, all while supporting the maintenance of a consistent energy level. Committing to eating a balanced diet does not have to be an overwhelming or taxing endeavor. In fact, when we’re dealing with chronic stress, our lives are often rather complicated, and our systems generally respond better to solutions that are comparatively simple. The diet needs to be a wholesome source of nourishment and grounding. While you can certainly study the nuances of eating a vata-pacifying, pitta-pacifying, or kapha-pacifying diet, it is probably best to focus on emphasizing healthy, whole foods, and minimizing processed foods, stimulants, and refined sugars (which we often reach for when time is short and our bodies are craving nourishment). If you don’t have a lot of time to cook your own meals, soups, stews, root vegetables, and other simple, grounding foods are usually good choices. Or, choose prepared foods that are aligned with the healthy, whole food model. Asian restaurants and the prepared foods section of many health food stores often have a good range of options. We recognize that there is a lot to work with in the preceding paragraphs. As you prepare to ground, nourish, and rejuvenate, please keep in mind that Ayurveda is a very holistic and individualized system of medicine. Listening to yourself as you engage in this process is as important as each of the steps above. A slow, simple, gradual approach to change is far more likely to be supportive than an overly effortful attempt at perfection. Remember, the stress response floods our bodies with activating, energizing qualities that are light, sharp, hot, dry, mobile, and subtle by nature. Balance is therefore supported by quieter, more nurturing qualities that are naturally heavy (or grounding), slow, cool, oily, and stabilizing. Your process of embracing change should also feel nourishing and stabilizing—delicious, even. Go slowly. Be intentional. And more than anything else, listen to your deepest inner knowing, honoring where you are at each moment along the way. We hope that we can continue to support you on your journey toward a life of balance and vibrant health. 1 “Stress (biology),” Wikipedia, last modified 6 Nov, 2014, http://en.wikipedia.org/wiki/Stress_%28biology%29; I. Michael Borkin, “Women’s Hormones 101,” Alternative Medicine, 37 (September, 2000), 72, published online 12 Nov, 2000, http://articles.mercola.com/sites/articles/archive/2000/11/12/womens-hormones.aspx. 3 “Stress (biology),” Wikipedia; Michael Randall, “The Physiology of Stress: Cortisol and the Hypothalamic-Pituitary-Adrenal Axis,” Dartmouth Undergraduate Journal of Science, 3 Feb. 2011, http://dujs.dartmouth.edu/fall-2010/the-physiology-of-stress-cortisol-and-the-hypothalamic-pituitary-adrenal-axis#.VGDwh4d2f9h. 7 Claudia Welch, Balance Your Hormones, Balance Your Life: Achieving Optimal Health and Wellness through Ayurveda, Chinese Medicine, and Western Science (Cambridge: Da Capo Press, 2011), 3. 8 Charaka, Charaka Samhita, trans. Dr. Ram Karan Sharma and Vaidya Bhagwan Dash, vol. 1, Sutrasthana (Varanasi: Chowkhamba Sanskrit Series Office, 2009), 388–89, Sutra Sthana, chap. XXII, ver. 9–17. 9 Welch, Balance Your Hormones, 45. 10 Vasant Lad, The Complete Book of Ayurvedic Home Remedies (New York: Three Rivers Press, 1998), 260. 11 Kelly McGonigal, “How to Make Stress Your Friend,” Ted Talk, Jun. 2013, TEDGlobal 2013, http://www.ted.com/talks/kelly_mcgonigal_how_to_make_stress_your_friend#t-512154. 12 “Why Do We Sleep, Anyway,” Healthy Sleep (Harvard Medical School: Division of Sleep Medicine), last modified 18 Dec, 2007, http://healthysleep.med.harvard.edu/healthy/matters/benefits-of-sleep/why-do-we-sleep; “Sleep,” Wikipedia, retrieved 15 Jul, 2014, Functions, https://en.wikipedia.org/wiki/Sleep#Functions. 13 Welch, Balance Your Hormones, 24–5. 14 Sebastian Pole, Ayurvedic Medicine: The Principles of Traditional Practice (London: Churchill Livingston, 2006), 105; Vasant Lad, Textbook of Ayurveda Volume 3: General Principles of Management and Treatment (Albuquerque: The Ayurvedic Press, 2012), 154–5.